How to grow and maintain indigenous bulbs. Many bulbs are waterwise, many in fact thrive in very dry rocky places including dry shade which make them ideal for an increasingly hot and dry environment. 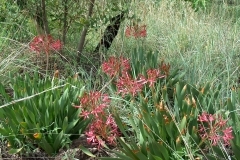 Many can and should preferably be left undisturbed in the ground even during dormancy such as Crinum, Scadoxus, Ammocharis so that notion of ‘bulbs are too much work’ is simply false. Just by taking the time to carefully select the best varieties for your garden whatever the style, patio, balcony or roof garden, you can have a very low maintenance bulb collection to be proud of. One of the Golden Rules for growing most bulbs is that a very well drained potting medium is a necessity. The big difference between winter and summer rainfall bulbs is that the winter bulbs prefer a more sandy growing medium and do not require feeding ie bonemeal or superphosphate. The soils in their natural habitat are usually very poor. If you really want to add fertilizer, the winter bulbs can tolerate a water soluble fertilizer with a high potash content or organic fertilizer with a low phosphate content. We use very well drained potting mediums: usually one part fine sand, one part course sand and one part potting soil or leaf mould compost. Bulbs that have a tendency to rot easily can be planted in pure fine and course sand. Silica sand is preferable. Do not use building sand because it compacts with age like concrete! There is no need to put lots of stones in the bottom of any containers for good drainage, the growing medium itself must be well drained. The water must drain right through. Another Golden Rule, the bulb size determines the size of the container. Dwarf bulbs obviously require small pots and can also be planted in pudding bowl type containers which are quite shallow. Species with medium growth habits usually require pots that are 20-30cm in diameter and larger species, 35-40cm diameter pots with equal depth. Pay careful attention to the watering regimes for pots that are positioned on hot patios or roof gardens in full day sun. We prefer to keep most of our containerised bulbs in semi shade (ie half day sun) or dappled shade (filtered sunlight) as we are in a particularly hot and dry valley and our summers can be scorching. If you use small containers and place them in full sun, they heat up and dry out quickly and the bulbs can dessicate. If you reside in a part of the world where the winter temperatures plummet down to minus 20 degrees Celsius and even colder, we advise you to plant South African bulbs in containers. If you live in a Mediterranean climate, the winter bulbs can be planted in the garden. If you live in an almost year round very dry and exceptionally hot place like the Middle East, best to plant the bulbs under some shade. Our experience has been that humidity is a killer for winter growing bulbs when they are dormant during extreme summer heat. If you have a small greenhouse in a very hot climate, ensure that there is more than enough ventilation. In South Africa, most summer growing/winter dormant bulbs are frost hardy. The evergreen bulbs are usually semi-hardy (the foliage will be burnt by bad frost). The winter growers should be protected from frost. An equal amount of course sand and potting soil/compost/well-rotted leaf mould. The golden rule applies again, namely the water must drain freely through the soil. Golden rule when in doubt: less is more when it comes to watering most bulbs. There are bulbs that love water but most are waterwise and should never be constantly watered or planted under automatic irrigation systems particularly the winter growers. Winter rainfall regions: winter growing bulbs can usually survive on rainfall alone unless of course there is a serious drought in which case, a deep watering every 10 days is advisable. True bulbs usually need to be planted with their tip or neck just above or just below the soil. Corms, tuberous stems and stoloniferous corms need to be planted 3-5cm below the ground. Gladiolus, Babiana, Ixia and Watsonia should be planted 2.5 to 7.5cm deep. Daubenya and Massonia require deeper planting 5-7cm. 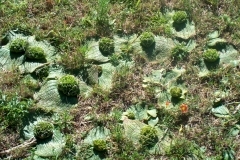 Most amaryllids should be planted with the neck at soil level or just below. Certain species like Boophone, Scilla, Drimia elata & Urginea must be planted with half the bulb above the soil. Why do some bulbs flower sporadically or have not flowered at all since you purchased them years ago? Most bulbs do not like to be disturbed, it takes a while (even up to 2 years) before they are content in their new spot and should start flowering. ‘Bulb abuse’ which includes not watering them when they should be watered, over-watering which causes rot and then its game over, watering them during dormancy, over-feeding, wrong placing (putting sun lovers in too much shade and shade-lovers in scorching sun), disturbing the roots by constantly loosening the soil in garden beds (this is unfortunately a favourite past time for many local gardeners who think they are ‘freshening’ the soil when in fact they are killing many of the plants). The bulb you purchased is unfortunately one of a few species that can be very shy to flower……………..patience. In our experience the following bulbs do require extra care. Boophone disticha – all forms of this magnificent bulb will rot if overwatered or planted in soil that retains even a little water. We have found that the transvaal form thrives if planted out into a rockery or veld garden (wild garden/meadow) when the bulb is still small ie about 2-3cm wide and left undisturbed and it only receives rain water. They do make beautiful container subjects but very special care needs to be taken with them and the pot or container should not be placed in full sun in a very hot area bearing in mind that in nature, tallish wild grasses afford them protection from the heat and their roots do not overheat as is the case in a pot on a hot patio. Galtonias – best planted in rockeries, embankments or elevated beds and left very much to their own devices. Ornithogalum thyrsoides – besides the rats that love them, they should also be planted out in their natural winter rainfall region and just left. They rot very easily in pots. 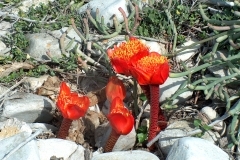 Veltheimias – they prefer dry shade beds and even during active growth, they should only receive rainwater with an occasional watering if it is exceptionally hot. Shade bulbs can of course also tolerate long periods of drought better than sun-loving bulbs and yellow veltheimias are even more fond of dry beds. Lachenalias – take care when you start watering them and how much you water them once they start sprouting. Best to water frugally until they are in full active growth in late autumn and once they are in full leaf, only water once every 12 days or so. 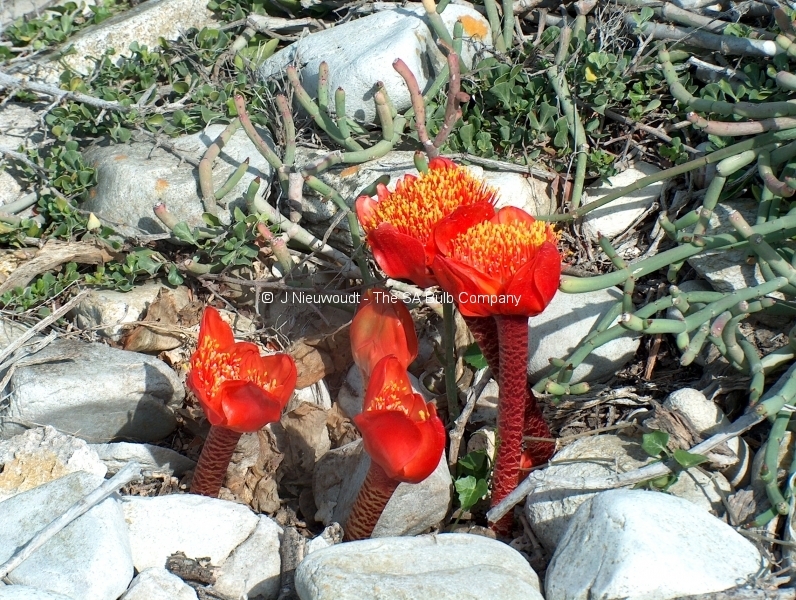 Haemanthus coccineus – they do not like to be transplanted from mid-summer through to mid-spring. 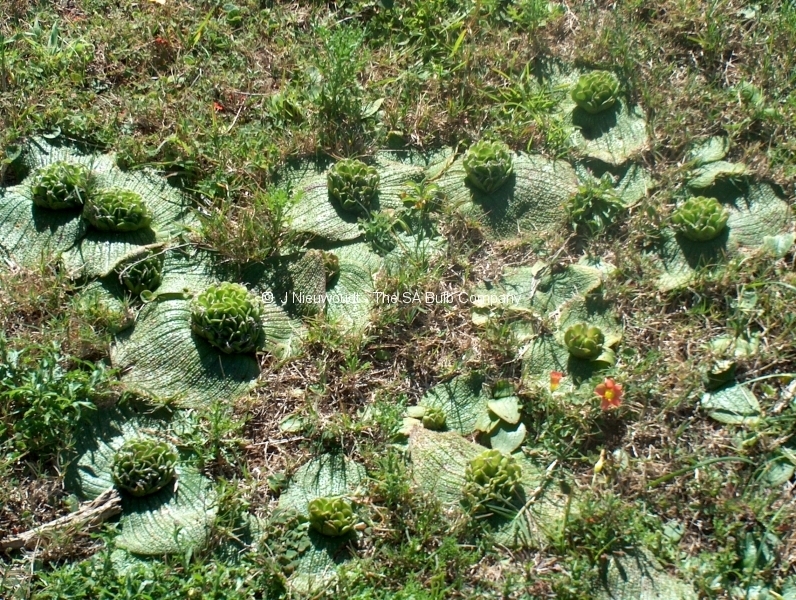 They tend to rot if disturbed at any time other than late spring or early summer when they are dormant. 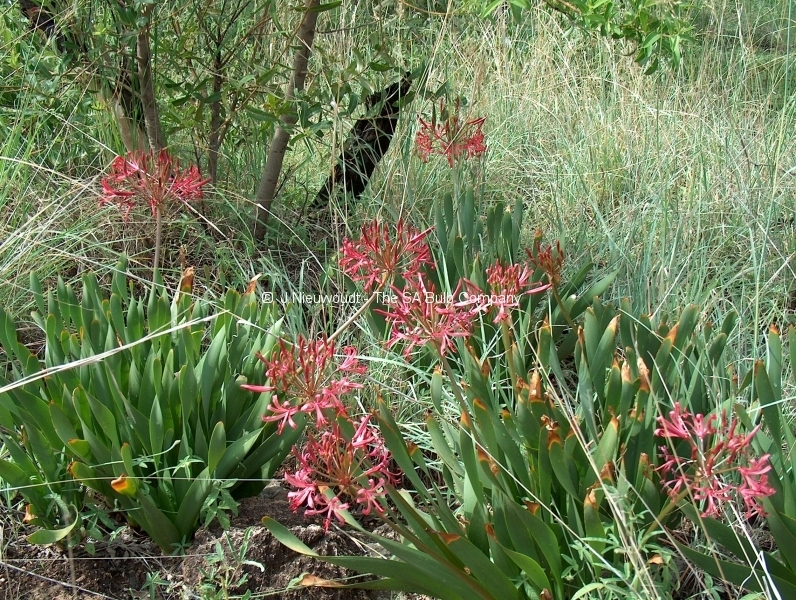 Cyrtanthus obliquus – extremely well drained soil and never overwater.